Kallamity (Luca Zampriolo) creates an imaginary future world dominated by dark undertones where protagonist robots (Hard Doll Machines a.k.a. H.D.M.s) mass-produced from recycled metal are needed in a failing society to secure resources for mankind in order to progress its technology. Kallamity poses the question, “As oil and gas are depleted in the future and inhabitants of Planet Earth continue to grow exponentially, how will a world based on the exploitation of these two natural resources maintain its current technological growth?” and then he precedes to present amazing visuals for the answer in the form of ABAKAN 2288. In this Sci-fi tale, with oil resources tapped out and the ensuing crash of the world economy, the Weingart family holds a dictatorial monarchy over Earth as a result of their development of WEIN technology which allows for the fabrication of H.D.M.s as well as travel to other planets for more natural resources. 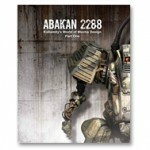 ABAKAN 2288 not only focuses on the images for the world that is yet to be but also on the creation of the Hard Doll Machine mecha designs. Kallamity designs the master patterns that are cast, assembles and creates machine dolls from these pieces of various sizes; ranging from a volleyball to the head of a pin. Being a worldwide success as a collectible sculptor of machine warrior dolls, readers will learn from one of the best in the industry how to conceptualize, fabricate and finish machine robots. Kallamity combines mecha designs with the steampunk aesthetic to create the stunning yet depleted Sci-fi world of ABAKAN that we hope to not have to occupy someday, as visually captivating as it is! Categories: Books, mech. Tag: Kallamity.